A newly formulated liquid based battery may be supplying us grid power in the near future. A team of researchers at MIT have developed a molten metal battery that can operate at 500C. This lower operating temperature makes it much more likely that these batteries can be manufactured and operated at a grid-storage scale. Batteries require positive and negative electrodes which are isolated by a separator to keep the electrode materials physically apart but electrically or ionically connected so charge can pass between the electrodes during the charge and discharge processes. The molten metal battery developed by MIT professor Donald Sadoway and his colleagues is constructed of metals and salts all held in liquid form by elevated temperature. Until this recent effort the required temperatures exceeded 700C. Their research and testing efforts have netted a 200C reduction which opens up construction material selection, reduced heating energy consumption, and allows considerably longer material life. 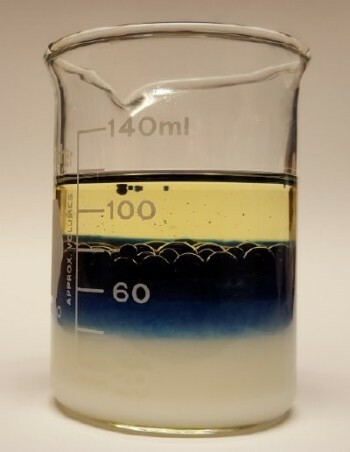 A physical example of liquid stratification using milk, bluing and oil at room temperature. In a molten metal battery, the top layer would be the lighter lithium metal negative electrode. The middle layer would be the separator or electrolyte, a molten salt mixture. The bottom layer would be the positive electrode consisting of the denser metal alloy of antimony-lead. 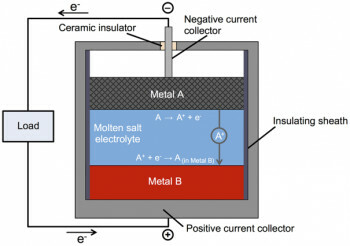 The electrodes are molten antimony-lead and lithium with a salt mixture separator. When heated to 450C the two electrodes and the separator self-organize into layers and remain separated due to their densities and immiscibility (like oil and water). As more of our grid power is supplied by renewable sources, the variability of these sources becomes more problematic. This is because large systems like classic power plants cannot be near-instantly ramped up and down to match the minute to minute variations in wind and sunlight. Presently, the only useful form of national electrical grid storage is pumped storage, which consists of hydro plants using reversible turbines backed by reservoirs. Unfortunately, pumped storage faces its own challenges. There are environmental impacts demanded by the enormous areas that need to be dedicated to the task. The required geography for a successful pumped storage site means that this form of energy storage can only be placed in locations that don't necessarily match the locations actually needing the electrical energy storage. That means more transmission costs which reduce overall storage efficiency. Batteries, on the other hand, could be placed locally to where they're electrically needed, eliminating new transmission infrastructure. Existing high energy rechargeable battery technologies based on Lithium Ion batteries have a relatively short lifetime, often on the order of half a decade. For utilities to be able to utilize batteries they typically need systems that will last more than twice that long. The newly developed molten metal battery is very close to meeting the aforementioned requirements. Their electrodes, due to their fluid state, do not become contaminated or coated with oxides or sulfates which whittle away at all dry chemistry battery's capacities over time. As soon as the Ambri company formed by Dr. Sadoway and his colleagues can finalize a seal design for their battery container, production of the Lithium antimony-lead battery for power grid usage can begin. It should be a major help to energy companies who want to pair them with their variable energy sources to allow uniform energy delivery to customers. For more details, check out MIT's website.